Never mind the denials. 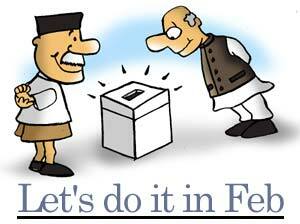 The Bharatiya Janata Party still wants to advance the Lok Sabha poll. A section of its leadership advocates going in for a vote-on-account in mid-January, dissolving the House thereafter, and conducting the election late February. BJP leaders informally discussed the idea at their recent Chintan Baithak on the outskirts of Mumbai. Senior Rashtriya Swayamsevak Sangh functionary Madan Das Devi, who liases with the government on behalf of all Sangh Parivar outfits, is reportedly all for it. But the final decision is with the BJP leaders, who will decide on it after they see the results of the forthcoming polls in Madhya Pradesh, Rajasthan, Chhattisgarh and Delhi. The BJP leadership is also keen to push through a constitutional amendment to synchronise the Lok Sabha and assembly elections. Indira Gandhi, while in power in 1971, had de-linked the two, and ever since the country has had to pay through its nose for the unending cycle of elections in one or the other states. Unfortunately, the BJP cannot make any headway on this without the Congress's cooperation, since the majority of states are with that opposition party. And the Congress is far from warm towards it. For Virender Sehwag, there is no life outside cricket. Or so it seems. The ace Indian opener, now playing for an English county, was unaware of the Time magazine -- and, so, made life tough for its correspondent. Since he would rather be featured on Sports Illustrated, Sehwag kept refusing the correspondent's request for an interview. Eventually, he agreed to one if the correspondent talked to him in flight, from Delhi to Mumbai. Now that his mug has appeared on the cover of Time, and his friends have told him it is an honour, we hear Sehwag is warmer to the magazine. Minister for Parliamentary Affairs Sushma Swaraj has eased out her Secretary V S Lakshi Ratan. No reason was given for the 1967 batch Tamil Nadu cadre IAS officer's summary removal just a couple of weeks after he joined her. But insiders say he was "not suitably deferential to the minister." Appears the last straw was Ratan's leave application during the coming monsoon session of Parliament, to attend a family ceremony. Ratan has now returned to the Planning Commission, his place in the parliamentary affairs ministry having been given to V K Agnihotri, a 1968 batch Andhra Pradesh cadre officer. Then there is this Indian ambassador who invited Prime Minister Atal Bihari Vajpayee, his foster family, and his all-powerful Principal Secretary Brajesh Mishra to dinner -- and forgot to extend the same courtesy to the two senior Cabinet ministers accompanying the PM. Or maybe the ambassador didn't forget. Maybe he knew his rise in diplomatic babudom depended not on the ministers but Vajpayee and Mishra. "Arrey, hum so parrey baitha karo, log kahtey hain hamare sambandh hain: Sit away from me, because people say we are rather close."